Doberman Pinschers are extremely loyal and loving dogs as long as they receive proper training and attention. Just like all breeds of dog, every Doberman Pinscher is different. Successful training of your pet will depend on leadership, consistency, supervision, and above all, patience. Learn more about our Doberman Pinscher canine training tips below. Doberman Pinschers were developed in Germany in the late 1800’s and were originally intended to be guard dogs. He is believed to be initially bred from German Pinschers, Rottweilers, and Black and Tan Terriers. This breed is a very loyal, intelligent, and energetic dog. Doberman Pinschers love having a job to do and work well assisting police officers, military workers, or search and rescue teams. Additionally, they make an excellent family member and loyal companion as long as he is properly trained from a young age. It’s important to start training your Doberman Pinscher puppy the day you bring him home. If you wait a few months to start training your dog, he will be much more difficult to deal with. Doberman Pinschers are intelligent animals and eager to please their owners, making him highly trainable as long as you start the process early on. Puppy training is the most important step of the training process for any dog as this is the time when they are most susceptible to new information. It’s a good idea to try to get your Doberman into a puppy training class by the time he is 10 to 12 weeks old, if possible. When you first start out with puppy training, your Doberman may exhibit some difficult behaviors. During this time, it’s vital that you communicate to your dog that you won’t tolerate those behaviors so that he doesn’t behave the same way as a fully grown dog. Doberman Pinschers love to chew when they are puppies. This is referred to as the “teething stage.” Although this behavior is natural for young dogs, it can be an aggravating and expensive habit. In order to prevent your Doberman pup from chewing through your shoes or furniture, provide him with a chew toy that belongs to him and make sure he knows that he is only allowed to chew on the toys specified for him. Crate training a puppy can help teach your Doberman Pinscher good behaviors and prevent puppy separation anxiety. The process can take anywhere from a few days to a few weeks. The crate should be large enough for an adult dog to stand in, as well as lie down and stretch out. In addition, you’ll want to fill the crate with comfortable bedding and some toys for him to play with. Crate training can be difficult with a new Doberman puppy, but since they are such smart dogs, he should pick up on the process quickly which will make house training easier. House training a puppy is a vital step for any pet owner. It will contribute to his health and well being, as well as improve his relationship with you and other members of your household. The key is to take your dog outside to go to the bathroom on a regular basis. At first, there will be some inevitable accidents between taking him outside before he is fully used to the routine. If your Doberman Pinscher goes to the bathroom inside your home, take him outside right away. Dogs don’t make the connection between being outside and going to the bathroom until the events happen basically simultaneously. The most effective way for training a Doberman Pinscher is to establish yourself as a strong leader. Dobermans need to be handled sternly, but this doesn’t imply that you should be mean to your dog. Instead be a firm leader so that he is taught at a young age that you are the dominant party. When your Doberman misbehaves, be sure to respond with a finger pointed in his direction and a firm “no”. Behavioral training is an important step to training any dog. First, you’ll want to take note of any unpleasant behaviors such as barking, biting, jumping, chewing, puppy aggression or separation anxiety. If you catch these behaviors when your Doberman is a puppy, you can communicate to him that he is not allowed to act that way. This will be much easier to do while he is still young. Doberman Pinschers love jumping up on people to greet them, which is an unacceptable behavior, especially when he gets bigger and stronger as an adult. It’s important to teach your Doberman puppy that this won’t be tolerated so he breaks the habit early on. Since Doberman Pinschers are such a smart breed with a drive to work, they respond very well to obedience training. This type of training will give your pup an opportunity to stimulate his active mind, get some exercise, and spend time bonding with his owners. During obedience training, every dog should learn five basic commands including “come,” “sit,” “stay,” “heel,” and “down.” It’s important to never give your Doberman Pinscher a command you cannot reinforce. Another highly effective way to train a Doberman Pinscher is reward training. Instead of punishing your pet when he misbehaves, you can give him a reward when he obeys a command or goes to the bathroom outside. Since he is so intelligent, the Doberman Pinscher works very well with non-aggressive reward-based training and will quickly pick up on the process. This will help create a positive connection between doing something good and receiving a treat or toy. With reward training, keep in mind that Dobermans have a strong drive for food and overfeeding them can cause canine obesity. Rewarding your dog with a small treat is okay from time to time, but access to a toy can be just as effective. One of the most important parts of training a Doberman Pinscher is teaching your pup to behave while he is outside on a leash. As adults, Dobermans are very large and powerful animals, so it’s vital that you have total control when your dog is on a leash and start the process when he is young. First, you’ll want to get a good collar. A head collar is recommended for Doberman Pinschers because of his size and dominant traits. With the collar on, you’ll want to walk next to your Doberman’s head. Instead of pulling on the collar and being dragged by your dog, quick, sharp pulls will suffice to gain control. It may take a few tries to get your Doberman Pinscher used to wearing a head collar, but if you use it correctly, it won’t hurt him. It may seem obvious, but another important piece of training a Doberman is teaching him his name. This will make the rest of your training much easier. Start calling your dog by his name as soon as you bring him home. Although it won’t understand that you are addressing it right away, over time, the repetition will help him learn to respond. It’s important to start socializing a Doberman Pinscher as early as possible. Like all dogs, this breed will respond to the process best if they are socialized at a young age. A few canine socializing tips may include taking your Doberman Pinscher to the dog park or dog-friendly stores, as well as introducing him to new people. If your Doberman puppy is constantly meeting new people and animals, he will learn to understand that it is a normal and enjoyable part of life. Without proper socialization, your Doberman Pinscher will grow up to be untrusting, unfriendly, and likely aggressive to people and dogs which will cause problems and be harder to correct when he is fully grown. Doberman Pinschers should not spend all day indoors. They require significant daily exercise and thrive in very active families. The Doberman Pinscher is a large dog with lots of energy and they can become destructive if they don’t get enough physical activity and playtime. Since they are such intelligent dogs, it’s important that the types of exercises vary. Doberman Pinschers love to run, hike, swim, play at the park, and participate in agility competitions. Providing your Doberman with the proper amount of physical activity will make training him much easier later on. Dobermans are trustworthy dogs and will usually behave well around children, friends, and family. They are known to be protective over their loved ones and more reserved with strangers, so it’s important to establish dominance with your dog and teach him not to confront every new person or animal they meet. Without proper training, Doberman Pinschers may take the job of protecting their family too seriously. Obedience training and respect training will help prevent this and diminish aggressive, confrontational behaviors. It’s vital that you remain consistent with training your Doberman Pinscher. The key to getting your dog to catch onto commands is repetition. Tell your Doberman over and over what you want him to do and make sure to be clear and firm when he misbehaves. Sending any mixed signals to your pet during the training period will confuse him and make the process more difficult and less effective. Doberman Pinschers are excellent at picking up new skills and behaviors as long as training is consistent. Dobermans are one of the smartest and intuitive breeds of dog and make wonderful pets. However, it’s important to spend time with your pup and train him consistently on a regular basis. 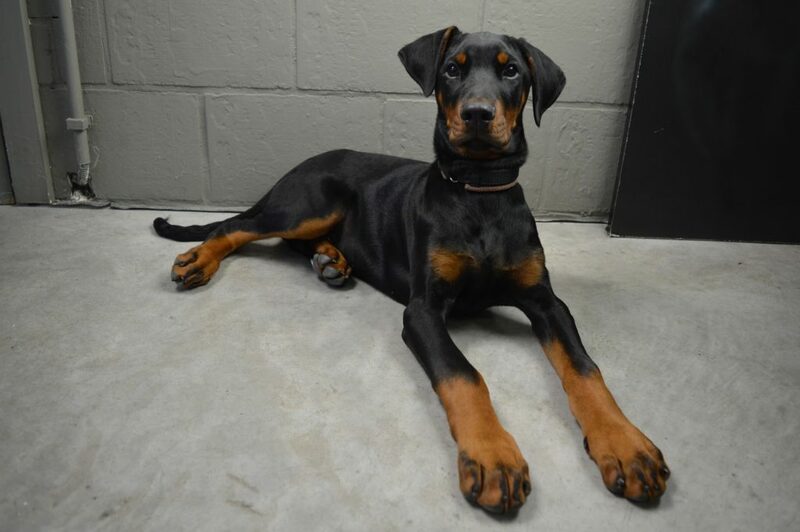 The Doberman puppy is a very cute animal, but they can also be quite destructive without the proper attention. Before adopting a Doberman Pinscher, consider how much time you will need to commit to puppy training, bonding time, and exercising him. Elliott, Pippa. “How to Train a Doberman Pinscher.” WikiHow, 22 Sept. 2018, Accessed 4 April 2018. www.wikihow.com/Train-a-Doberman-Pinscher. “Training Secrets for Doberman Pinschers.” Chewy, 19 July 2018, Accessed 4 April 2018. www.chewy.com/petcentral/training-secrets-for-doberman-pinschers. McNamara, Melissa. “How to Train a Doberman Pinscher to Come When Called.” Pets The Nest, 21 Nov. 2017, Accessed 4 April 2018. www.pets.thenest.com/train-doberman-pinscher-come-called-5017.html. “How to Train a Doberman for Protection.” WagWalking, 26 Feb. 2018, Accessed 4 April 2018. www.wagwalking.com/training/train-a-doberman-for-protection. “How to Train a Doberman Pinscher – Rules That Apply.” Petsworld, Accessed 4 April 2018. www.petsworld.in/blog/how-to-train-a-doberman-pinscher-rules-that-apply.html.